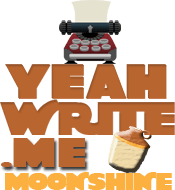 This entry was posted in Fiction, Writing and tagged gaming, moonshine, yeah write. Bookmark the permalink. I’ve been writing so much poetry lately – it was fabulous to delve into something a little more involved. Reading the story , I got so involved with the character that I wanted her push her to run away. great writing. That Angel girl needs to change her name to Anger and haul off on some bad characters. Stunning. Just stunning writing. Christine, this was beautiful, lyrical, captivating g. I could not tear away. Please tell me you’re working on more of this.